What is a saltwater fishing reel? What Makes a Good Saltwater Spinning Reel? First of all, as you already know, you do not need much equipment to go fishing. A few simple things like the fishing reel, the rod, and the bait are enough. The goal of fishing is to relax, disconnect and maybe a big catch! However, things in saltwater fishing are a little different because you need durable fishing gear. The reason for that is because the weather conditions on the sea can change from one moment to another. Furthermore, we decided to discuss the most important fishing tackle, the saltwater reel. 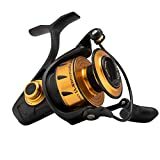 We will present you some essential features that the best fishing reels should provide and show you a review of the five best saltwater fishing reels. In the first place, a fishing reel is a mechanism that stores your fishing line on a spool that is placed on the fishing rod. This mechanism consists of multiple ball bearings that are responsible for the movement. Moreover, the outer mechanism has a main body with a handle, a spool, and the drag system also known as breaks. Additionally, if it is a fixed spool fishing reel, it has a pickup system. This type of spool will be analyzed below. The main characteristic of a saltwater fishing reel is the drag system that tires the fish to land it. Most saltwater fish species are very strong, whereas freshwater fish are hypotonic. So, before landing the fish, you have to give a great battle, not with your strength but with the reel’s drag system strength. That is also the usefulness of a saltwater fishing reel. Below, you can see some features that you should take into consideration before getting a saltwater fishing reel. Saltwater reels have two spool types, the fixed spool, and the multiplier spool. Fixed Spool Reel: This type of reel is used for many fishing techniques and especially for shoreline fishing techniques. The reel has an internal pickup system that retrieves the line, whereas the main spool-bobbin remains stable. Multiplier Spool Reel: This type is heavier and bulkier than the fixed spool and can be used only for boat fishing techniques. You have to put much effort to retrieve line due to the rotation of the whole spool. Drag system: Fixed spool reels have many different drag systems front or rear, whereas multiplier reels have side brakes (single or double). There is a wide range of saltwater reel materials on the market. However, the best saltwater fishing reels are made of aluminum alloy and stainless steel. The main body and the rotor should be made of durable and inflexible materials because there is a danger of saltwater corrosion. Additionally, the bearing balls are usually made of stainless steel, which is the only material that keeps your reel protected from the saltwater. Surprisingly, some big expensive multiplier spool reels are made of gold. Moreover, the handle should have some soft material so you can retrieve line without hurting your hands. Undoubtedly, the main cause of saltwater reel damage is the saltwater. What is the solution for this problem? A sealed system of course! Before getting a reel, you should take a closer look at the specifications where you can see if it has a protection seal system. This system is a protection gasp made of rubber that does not allow water to sneak into the mechanism. Nevertheless, if there is no sealed system, just make sure that it has stainless steel ball bearings. Stainless steel never rusts. There is no doubt that the drag system, also known as brakes, is the most important part of every reel. The drag system should not only be sealed and saltwater corrosion resistant, but also rigid and durable. The measurement unit of the durability of a reel is called max drag. Accordingly, if you want a strong reel, you should choose one with high max drag that will tire the fish easily. Also, a very important system is the anti-reserve. This system allows the reel to release line without any movement of the handle. Generally speaking, the durability of a fishing reel depends on three factors. The first is the material; the second is the construction and the last is the right maintenance. We will analyze the third factor because we mentioned the other two above. Noteworthy is the fact that you should never put the reel in the saltwater. Secondly, after each use remember to clean it properly. If you do these two things, your reel will last a lifetime. You can have a closer look at the videos below. This function is tightly connected with the drag system of your reel. The brakes should have multiple carbon fibers to provide a smooth fishing experience. Furthermore, reels with good ball bearings could also provide this smooth operation. We would like to emphasize the fact that a reel with many ball bearings does not mean that it is a high-quality reel. Undoubtedly, that they provide a smoother operation of the reel, but if they are of low quality, there is no reason to buy this reel. Moreover, reels with multiple ball bearings are more expensive. As far as the sizes are concerned, they come in different sizes. The size scale starts from 1000 and increases to 15000 for different fishing techniques. 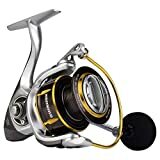 So each fishing technique requires a different reel size and the table below explains this perception thoroughly. The line capacity differentiates depending on the reel size. For instance, a 3000 reel has a line capacity of 250/0.30mm. There are three line types. The monofilament, the fluorocarbon, and the braided line. Consequently, braided line is considered to be more stable, durable but not elastic. Many anglers have the wrong perception that all fishing reels are braided line compatible. Obviously, this is a myth. The only reel with a circumferential elastic rubber ring is compatible with braided line. Keep this in mind because many reel sellers claim that there is no problem to load every saltwater reel with braided line. 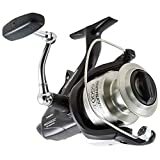 Firstly, this open face spinning reel is considered to be one of the best saltwater fishing reels in this category. The combination of the price and the incredible efficiency makes it a top ‘’value-for-money’’ fishing reel. Furthermore, there is a wide size variety between ABF 30 and ABF 90. Baitfeeder Avenger System: In a few words, this is a second drag system to have a better control of the fish. This system gives you the opportunity to minimize or maximize the applied pressure through one simple lever on the side of the reel. This is an innovation of Okuma. Ball Bearings: 6 ball bearings made of stainless steel provide a smooth reel operation and make sure that it will not rust. Spool: The package includes two spools. The first main spool is an anodized aluminum spool and the second is a graphite spool. Both spools are saltwater resistant. Quick-set anti-reverse: When the fish is on the hook there is no need to worry about. It will release line without any other movement. The graphite spool is suitable for this system as it is saltwater corrosion resistant. Sealed Hydro Block System: Even if some water sprays touch your reel or if it falls accidentally in the water, the hydro block system will keep it safe. Finally, this reel is one of the top selections amongst the fishing community. The reason is obvious. It has many features that you only can find in expensive reels. Okuma took to heart every fishing demand and put these new features in the Avenger fishing reel. First of all, Penn managed to construct a reel that can withstand any harsh weather conditions. The reel sizes increase progressively from 3500 to 10500. This extraordinary reel made by Penn utilizes many innovative ideas that you have never seen before. Durability and saltwater Protection: As a matter of fact, saltwater is one of the main damage causes. However, Penn took this into consideration and created a water tight design and a sealed drag system. Three drag washers protect it from the nature elements. Line Capacity Rings: These rings help you to realize how much line is left on the spool. Summarizing, this is a good choice for every angler. The only drawback generally speaking is the price. However, if you want to invest in a good quality fishing reel, this could be one of them. Many people claim that this reel has a lack of smooth performance. Nevertheless, that factor depends only on the angler. The Daiwa Opus Saltwater Spinning Reel promises flawless and a great casting performance. All four models are well-constructed, and the sizes are ranging from 4500 up to 6000. Fishing is considered by many anglers as a very expensive sport. However, Daiwa invested in a saltwater reel that is both durable and affordable. Incredible Gearing System: 4 stainless steel ball bearings and one roller bearing are responsible for the excellent performance. Digigear digital gear design is an innovative technological advancement created by Daiwa that offers a smooth drag. Max Drag: All models have a max drag of 33 lbs which is more than enough to land a big fish. As a matter of fact, this reel is a saltwater reel especially recommended for boat fishing. Spool: The spool is the most important part of a reel after the drag system. Daiwa used the aluminum material for the spool to provide durability and convenience. All reel models are lightweight. Twist Buster technology: This technology protects the line from twisting. To sum up, all four models have an excellent gearing system. Despite the fact that the main body of the reel is made of plastic, it offers durability. Accordingly, if you take care of the reel, it will not let you down. There is no doubt that we can sum up the review of this Shimano reel in two words. Castability and Performance. Moreover, it has front and rear brakes that will give you a smooth fishing experience. This reel comes with a gear ratio of 4.8:1. Propulsion Line Management System: After many tests of the Shimano team they managed to design a line system that provides better casts. Dyna-Balance (No wobbles anymore): Furthermore, this Dyna-Balance technology also created by Shimano eliminates and minimizes all the vibrations and wobbles created while retrieving line. The same technology is used by the car industry. Frame and Rotor: They used graphite to construct the frame, rotor, and side-plates. Graphite is well known for its durability and water corrosion resistance. Varispeed Oscillation: Shimano proves again, with this innovative idea, that she is the leading company in constructing reels. In a few words, this system improves the speed of the spool. Finally, what is not to love? This well-balanced saltwater reel promises great casts and stability while fishing. However, the price can be considered a little high, and this is maybe the only drawback. Despite that fact, we recommended for all saltwater anglers. The KastKing Kodiak, true to its name, is a king between many other saltwater reels. It comes in four different models, and it is recognizable from the beautiful gray and gold design. After a long hour research, we came to the conclusion that it is a really good saltwater reel. Lightweight: The weight scale starts from 10.10oz and increases up to 12.38oz! Obviously, the reel is extremely lightweight, and that is because it is made of anodized aluminum. The spool is crafted of CNC machine cut aluminum with an extra protection system. Finally, there is no doubt that if you are a saltwater fishing enthusiast, this is a reel that can fulfill your fishing needs. The only drawback is in the design, but all the other features are great. This reel utilizes technological advancements that other reels can be jealous of. Summarizing, saltwater fishing is more demanding than freshwater fishing. Consequently, before buying the best saltwater fishing reels, you should be careful because the saltwater is a severe enemy of all metals. However, this should not discourage you. If you take all the features mentioned into consideration, you will face no problem in the future. Thank you for your attention.